Bright embossed golden and silver foil icon mounted on wood. Hinged for easy display on your desk, nightstand, or library. SIZE: 9 1/2" x 5 1/2"
The Theotokos is enthroned as the Queen of all. In the Russian tradition Virgin Mary presented as the Queen is entreated on behalf of all suffers of cancer - the suffers of cancer are not only those who have the disease but all of those who know and love that person. 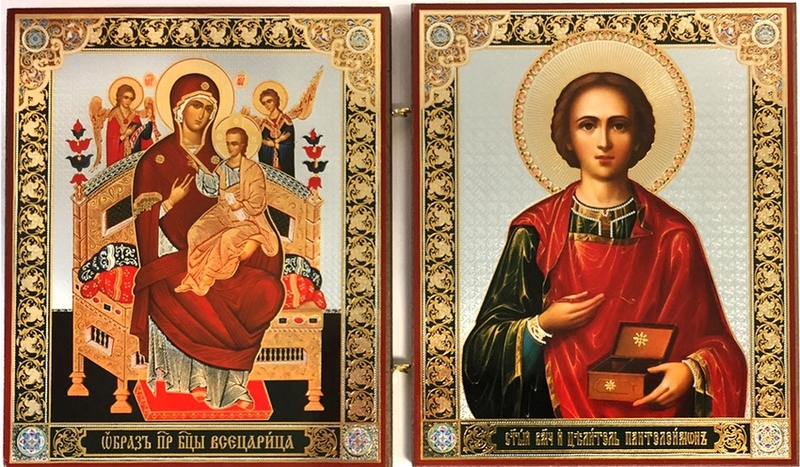 St. Panteleimon had been educated as a physician, and he "dedicated his life to the suffering, the sick, the unfortunate and the needy. He treated all those who turned to him without charge, healing them in the name of Jesus Christ. He visited those held captive in prison. These were usually Christians, and he healed them of their wounds. In a short time, reports of the charitable physician spread throughout the city. Forsaking the other doctors, the inhabitants began to turn only to St. Panteleimon.